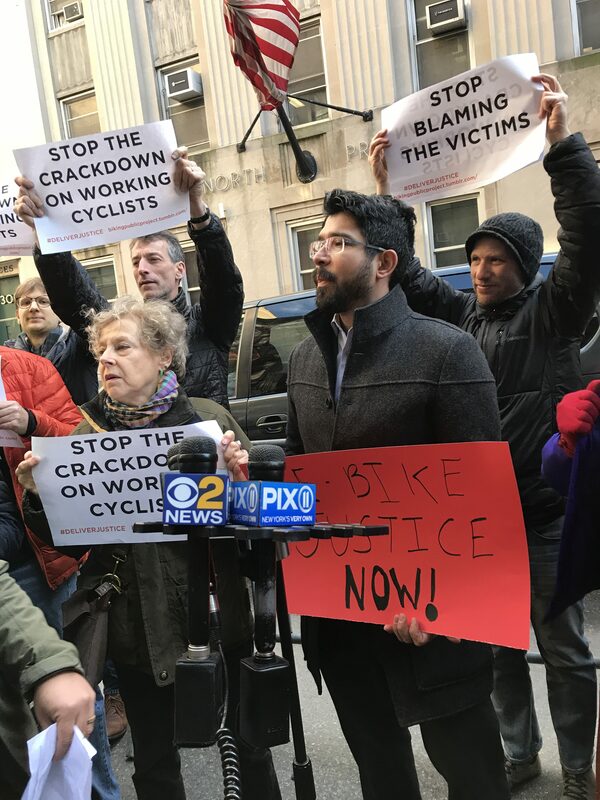 Scores of cyclists — but only one elected official — took their fight against police abuse against delivery workers to the Midtown North stationhouse on Friday, rallying to cap off a week in which one cyclist was killed by a still-at-large hit-and-run driver, another cyclist was tackled by a police captain and several riders were slapped with tickets for actions that are not even illegal. Chanting the names of delivery workers and other cyclists who have been killed by drivers, including Chaim Joseph on Monday, protesters not only decried the NYPD for disproportional crackdowns on cyclists, but also a mayor who proclaims New York as “the Fairest City in America” yet directs officers to target immigrant workers who rely on electric bikes to scrape out a living. 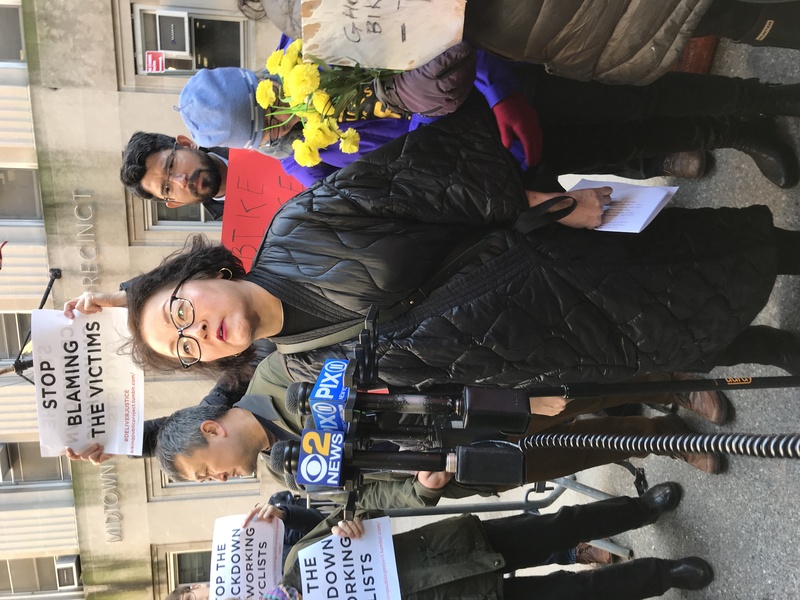 JoAnn Yoo of the Asian American Federation, one of the organizers of the hastily arranged rally, recalled a Streetsblog story from last week which chronicled more than a dozen e-bike food deliveries to 1 Police Plaza on the coldest day of the year. “If you are going to crack down on delivery workers, at least don’t benefit from their hard work. This is called hypocrisy,” she added. Here is the tackling incident on Thursday that stoked rage today. 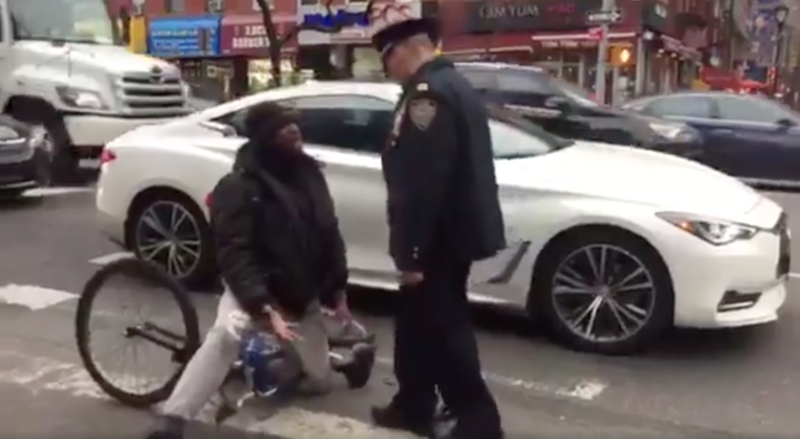 The NYPD says its enforcement against illegal electric bikes stems is a matter of public safety, but police officials have never offered statistics suggesting that e-bikes are causing crashes in any significant numbers. Of the 201 people who died on the roads of New York City last year, none was killed by a bike rider. Transportation Alternatives spokesman Joe Cutrufo mocked the NYPD statement. 1. How can we be America’s Fairest City if low-income, mostly minority, delivery people are treated this way? 2. How can we be America’s Fairest City if cops routinely target cyclists after a cyclist is killed by a driver? City officials also said that 3,855 moving violations were issued to cars in Midtown North precinct and 315 moving violations were issued to bikes in that same area. They touted the ratio as 93-to-7. Cycling represents just 1 percent of all trips in the city, statistics show. Update: An earlier version of this story misidentified cycling victim Chaim Joseph due to an erroneous initial NYPD report. Cyclists comprise 7.6% of moving violations but just 1% of trips. Seems like gross overenforcement. It’s even more lopsided when you consider the numbers killed by cyclists (a few per decade) versus those killed by motorists (~200 annually). Going by this statistic, it should be more like 3,855 moving violations to cars and about 10 for cyclists. 1) Make it legal for cyclists to yield at red lights and stop signs. 2) Legalize e-bikes, especially the throttle-controlled ones favored by delivery people. 3) Make sure the NYPD understands that there is no law which prohibits cyclists from leaving bike lanes at their discretion. 4) Clarify that there are no helmet laws for adult cyclists. While they’re at it, repeal the helmet laws for child cyclists. DOT can also help by installing bike signals at intersections which flash yellow when motorists get a red light. They did this in a few limited locations like the PPW bike lane but this should be general policy at every signalized intersection, unless lines of sight make it impossible to safely pass a red light. So they’re overreaching their enforcement of cyclists by a whopping 760%. I honestly believe much of this is due to the fact that ticketing a cyclist is considerably quicker and easier than ticketing a driver. We already know that the NYPD is unenthusiastic about policing traffic, so it stands to reason that they’ll always take the path of least resistance in their approach to it. A ticket is a ticket, and they don’t give a flying f*** how effective those tickets are at reducing road deaths. Once you also factor in their clear disdain of cyclists as a demographic, well there’s your 760%. I spoke to a helpful officer today on the community affairs line for the Midtown North Precinct. He claims that enforcement is related to community requests, and unrelated to Joseph Chiam’s death. He agreed that vehicles pose the far greater danger on city streets, and said that nearly all traffic incidents they are called for involve a car. I mentioned that I had heard that 10% of traffic tickets are given to bicyclists (realize now that the number is 7%), and he expressed surprise, suggesting that number is far too high. Maybe the precinct doesn’t realize the extent of this bias? I encourage community members to consider attending next Tuesday, the 19th, to share their concerns about enforcement. So let me understand this. If someone is an immigrant and using a bike to make a delivery but breaking the law at the same time, the cops should just ignore them because they’re an immigrant? Getting a little sick and tired of immigrants being coddled. Following the effing rules of the road. EVERYONE. Cyclists are angry after one of their own is tackled by a cop. But that's just a symbol of a long-simmering rage at the way bicyclists are treated in this city.